The Ragnarok Challenge is a new event for the Viking 4x4 Club. It will be for teams of 5 trucks - ONE of which MUST be Class 1. 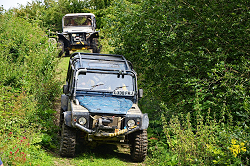 (Max 6 teams) This will be held on Boughton Estate land near Kettering in Northamptonshire (Weekley Woods / Geddington Deep Scar). Forms can be downloaded from the Forms page. This will be run in Weekley Woods and will consist of 6 timed sections which will include a number of punches. All 5 trucks must get through each section in turn, collecting punches as they progress through the section. 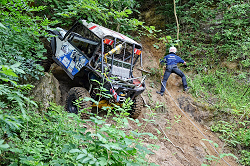 DNF times will be set at approx 45 minutes per section and each of the 6 section times will start on the hour – whether the competitors are ready to start or not. There will be a mandatory break at lunch time. This will be very similar to Day 1, but with an early start and will be run in Deep Scar with a short break for lunch which will facilitate a finish time as early as possible.